**UPDATE** After three continuances since April, as of July 10th 2013 an arrest warrant has been issued for Anne "Ursula" Bielski for failure to appear in court. Additional bail has been set in the amount of $3,000. On March 13, 2013, Ursula Bielski of www.chicagohauntings.com was charged and arrested for Disorderly Conduct and Criminal Trespass To Real Property. She was found at the residence of Pete Crapia ( host of www.bachelorsgrove.com ) while intoxicated and refused to leave even though she was previously told by the Palos Hills Police not to have any contact with Pete Crapia whatsoever. Police discovered that Bielski drove to the residence while intoxicated but because she was at the back door upon their arrival they did not arrest her for driving while under the influence. Police stated that Bielski "reeks with booze" while she was taken into custody. A sobriety check was performed and an empty flask was found in her automobile before it was towed away. Anne "Ursula" Bielski was initially charged with Disorderly Conduct for kicking the back door and screaming. Evidence indicates she was attempting to enter the residence using the door knob even before anyone inside the residence responded, and when she could not open the door Bielski can be heard repeatedly stating to "open the door" while occasionally punching and kicking the door multiple times to try and force her way in. Even after Bielski was notified of police being summoned to the residence, during the 911 call you can still hear her trying to gain entry through verbal and physical means. She later sat down on the back porch and that is when the police arrived to investigate the incident. According to the evidence, Bielski told police that she showed up to the residence in order to "make amends" and to "work together again on a stupid book" which would relate to the topic of Bachelors Grove. 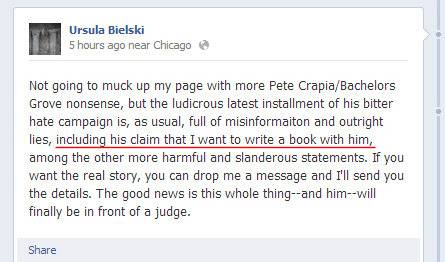 Although Pete Crapia previously declined to work with her on the book out of personal reasons months before this incident, she later posted to her Facebook account that the claims of a book deal were false by stating it was "harmful and slanderous" to suggest that any book deal was discussed. While she was being processed at the police station they also discovered that she was in fact told to stay away from Pete Crapia and that she lied to police when questioned in her previous altercation on February 27, 2013 which resulted in her and Karl Kochmann being told to stay away during an interrogation at the Palos Hills Police Department. Charges of Criminal Trespass Of Real Property were filed. Her bail was set for $1000 and $120 on separate charges. A court date is scheduled in April of 2013. Attention: The following video contains foul language. The following was extracted from Ursula Bielski's statements on the Internet. The underlined comment absolutely contradicts the facts presented above in the arrest video.